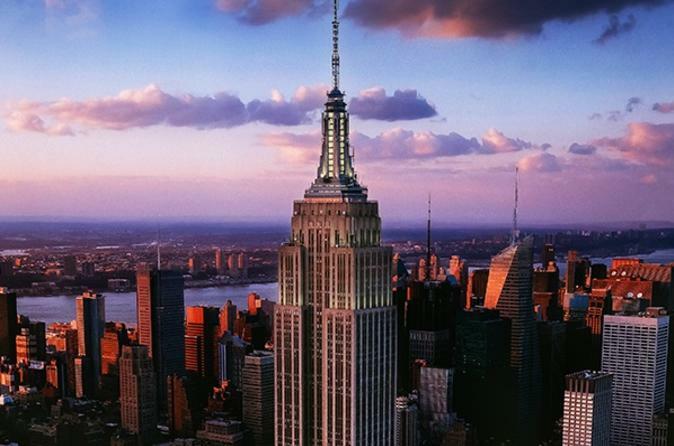 The must see for any visitor to New York City, the World’s Most Famous Building is on every list for its Observatory’s spectacular indoor and outdoor 360-degree views from the heart of Manhattan. Along the way, become a part of history as you journey through this Art Deco masterpiece including the restored lobby and murals. Download our free multi-media app and experience the exhibits tracing the building’s construction, learn how the Empire State Building became one of the most energy efficient buildings in the world. Open from 8am to 2 am, along with a gift shop filled with exclusive items, there are several dining options including the fine cuisine of State Grill and Bar. Located in the heart of New York City it’s an easy walk from Times and Madison Squares and just up the street from Macy’s. Daytime or night - anytime is the right time to visit the Top of the Rock Observation Deck. Perched 70 stories above the city at Rockefeller Center, the panoramic, 360-degree views of Manhattan are unequaled anywhere else in New York City. Upon arriving at 30 Rockefeller Plaza, take time to admire the stunning, shimmering Swarovski chandelier on your way to the exhibits of Rockefeller Center’s historic construction during the Great Depression. Ascend to the Top in less than 1 minute with a ride up 850 feet (260 m) on the Sky Shuttle. Explore 3 floors with expansive, unobstructed indoor and outdoor viewing areas. The breathtaking views stretch for miles in every direction! You'll feel like you are floating above Central Park as you take in views of New York's most famous landmarks including the Empire State Building, the Chrysler Building, One World Trade Center, and the Statue of Liberty. Top off your visit on the 70th floor, a completely open-air deck! 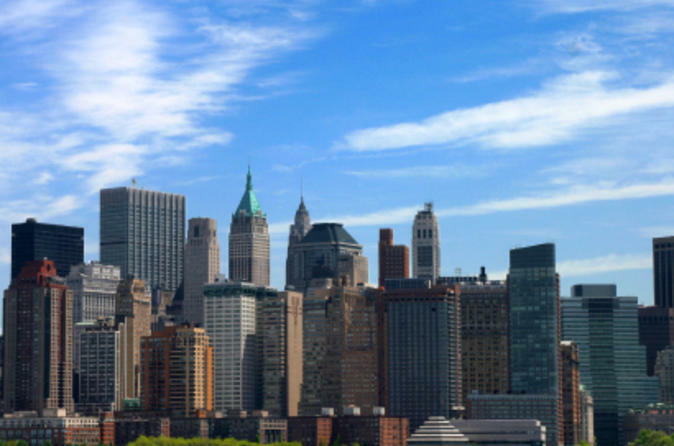 Create your own sightseeing itinerary with the New York City Hop-On Hop-Off Tour! A hop-on-hop-off bus tour is the ideal way to explore every corner of the Big Apple and, with lively tour guides to keep you entertained and informed, you are sure to learn facts old and new about the city that never sleeps! 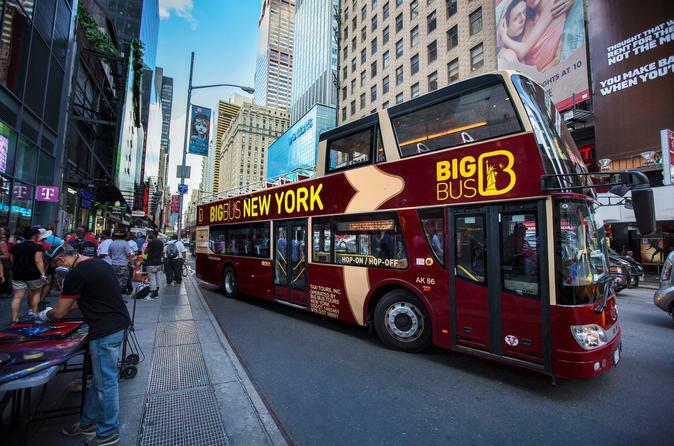 Hop on and off the distinctive double-decker buses at any of the 50+ stops to discover New York at your leisure. 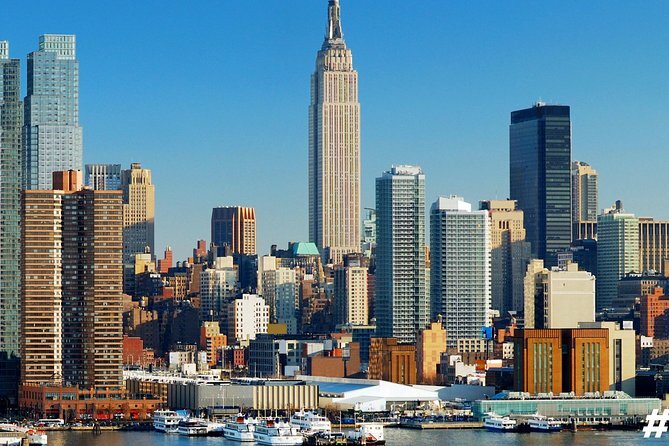 A must-have tour for any visitor to the Big Apple! Choose the Downtown Loop for a 24-hour ticket covering Lower Manhattan or upgrade to a 48-or-72-hour All Loops ticket to include Harlem, Brooklyn and a Night Tour to make the most of your time in New York. For more value, opt for the FreeStyle Pass and benefit from a 72-hour All Loops ticket plus 3 additional cruise, attraction, meal and museum options including the Empire State Building, Guggenheim Museum and Madame Tussauds. Or go VIP All-Access to skip the lines at bus stops and enjoy more frequency. 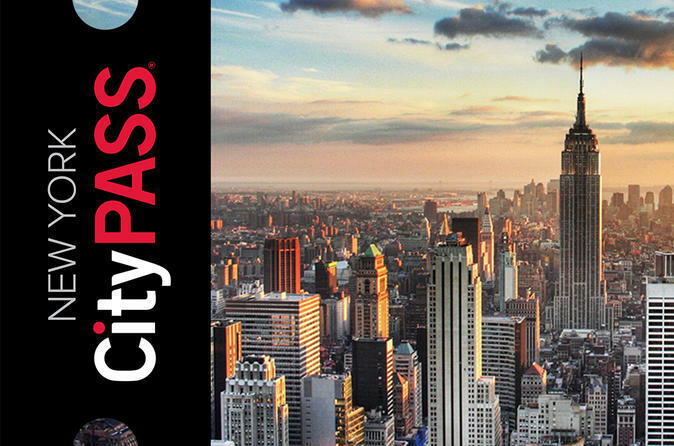 Get the New York CityPASS, the best deal in the Big Apple. 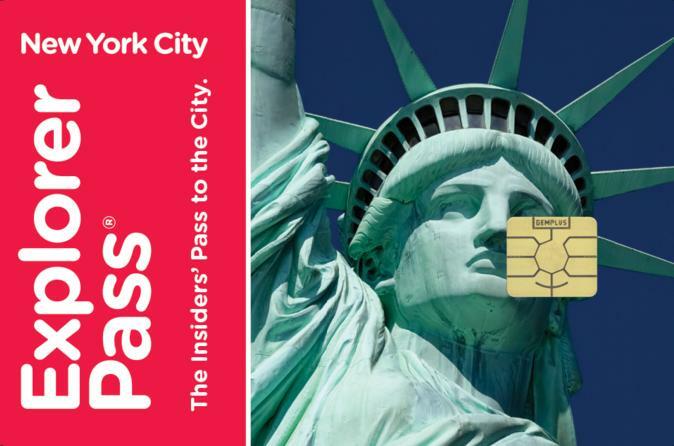 Your New York CityPASS saves you time and money as you skip long ticket queues for entry to six of New York's premier attractions. 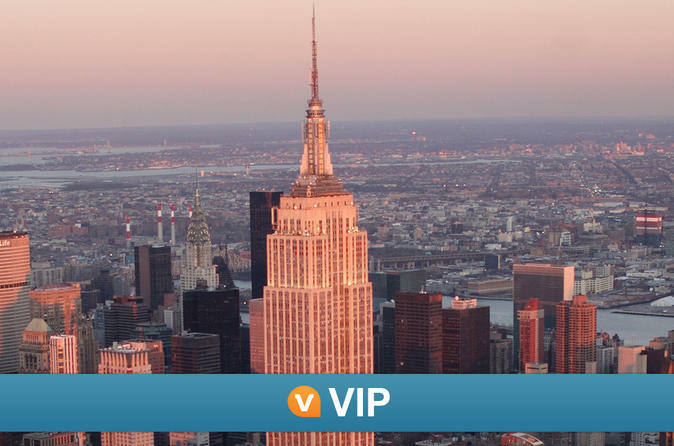 Experience New York City like an insider on this action-packed VIP tour that includes early access to the Empire State Building, skip-the-line entry to the Intrepid Sea, Air & Space Museum, an open-top bus tour, and a hop-on-hop-off cruise. You can upgrade to also include afternoon admission to the 9/11 Museum. Seem like a lot to do in one day? Opt to take your cruise the following day. It's a great way to see NYC’s newest sites and its most iconic attractions, and a Viator exclusive package that can't be booked anywhere else! Gain a deeper understanding of the events surrounding the attacks on the World Trade Center on September 11, 2001, and the acts of heroism that rallied a nation on this 1.5 hour walking tour of Ground Zero. 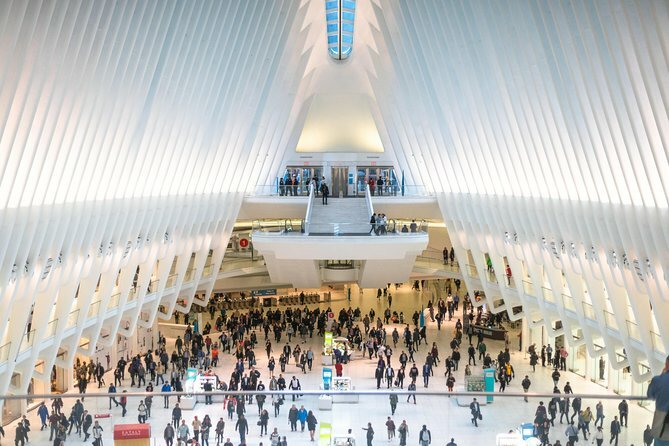 A certified guide with a personal connection to the events shares firsthand stories as you explore the site of the former World Trade Center and the National 9/11 Memorial, where you can pay tribute to the lives lost. 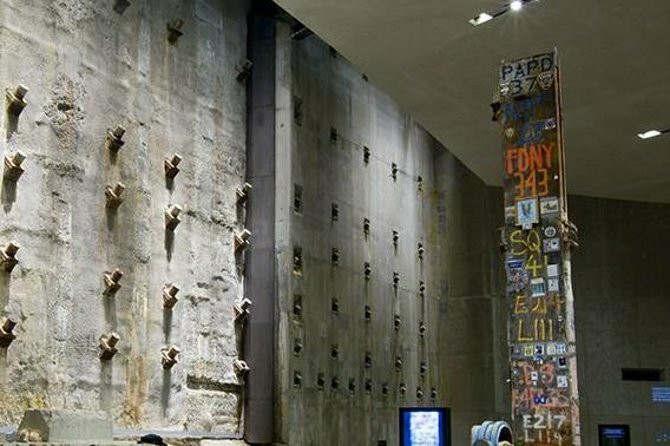 Choose to upgrade and add on a ticket to the 9/11 Museum to see artifacts associated with that fateful day. Enjoy an in-depth experience of two top New York City attractions with this special-access tour, a Viator Exclusive available nowhere else. Learn about the history of New York on a guided walk down Wall Street, followed by a tour of two symbols of American freedom, liberty and perseverance: the Statue of Liberty and the 9/11 Memorial. After an immersive visit to the World Trade Center site with your expert guide, gain access to the reserve line for the ferry to Liberty Island, offering sweeping views of Ellis Island, New York, New Jersey and New York Harbor. 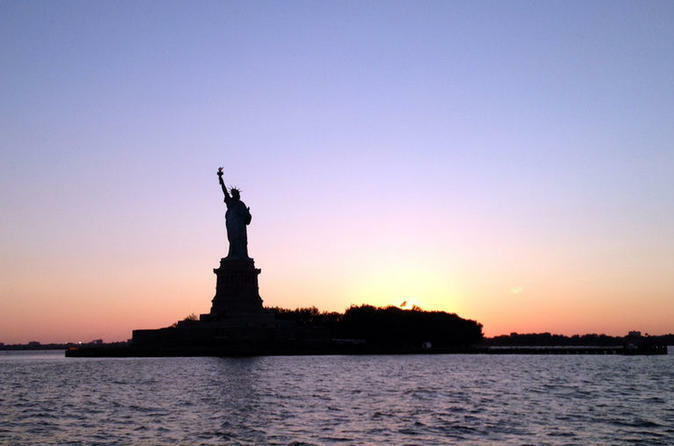 Enjoy an audio tour of Liberty Island and reserved access to the statue’s museum and pedestal. Then, snap photos of iconic Lady Liberty from the water and admire the NYC skyline on your ferry ride back to Lower Manhattan. Choose from three exciting itineraries over 4, 6 and 8 hours and enjoy a comprehensive small-group guided sightseeing tour of New York City by minibus! On all itineraries, you'll experience the sights and sounds of Lower Manhattan, Midtown Manhattan and Upper Manhattan, from Battery Park to Harlem, passing such famous sites as Times Square, Fifth Avenue, Central Park, Madison Square Garden and Greenwich. 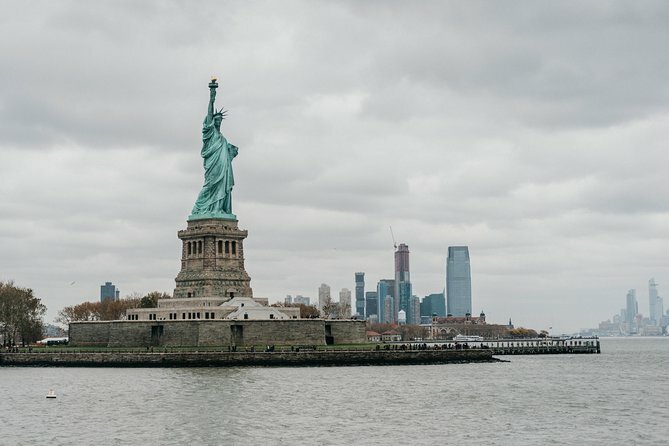 For a more in-depth experience, opt for the 6-hour tour and explore Wall Street, the South Street Seaport, One World Trade Center and more by foot, and enjoy a New York Harbor cruise for amazing views of the Statue Liberty. You'll also enjoy an authentic lunch in Little Italy at one of the neighborhood's oldest restaurants, Grotta Azzura. 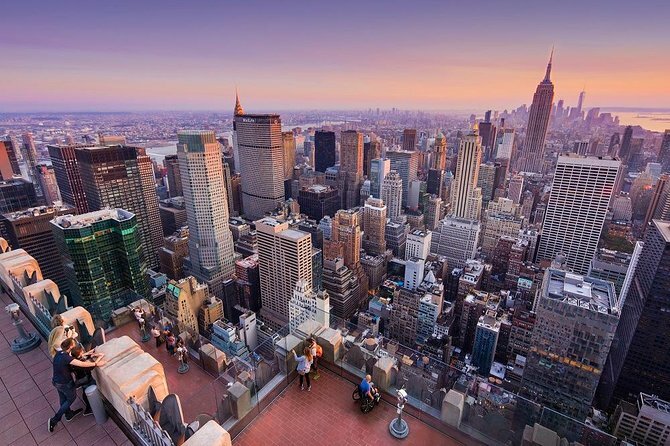 Upgrade to the full-day, 8-hour tour and receive all this plus admission to the observation deck atop Rockefeller Center, where you’ll get incredible panoramic views of the city below. The choice is yours! We're committed to providing more enjoyable sightseeing experience. 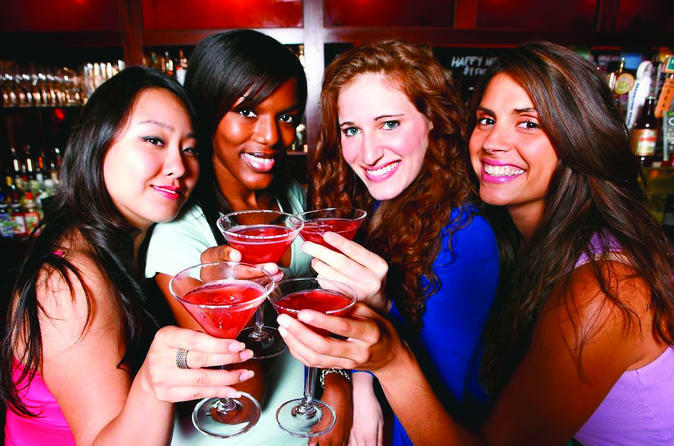 Our Discover NY Tour is a recipient of numerous industry-recognized awards! Enjoy 15-minute guided walking tours of NYC's iconic places - Central Park, Rockefeller Center, 9/11 Memorial & more! 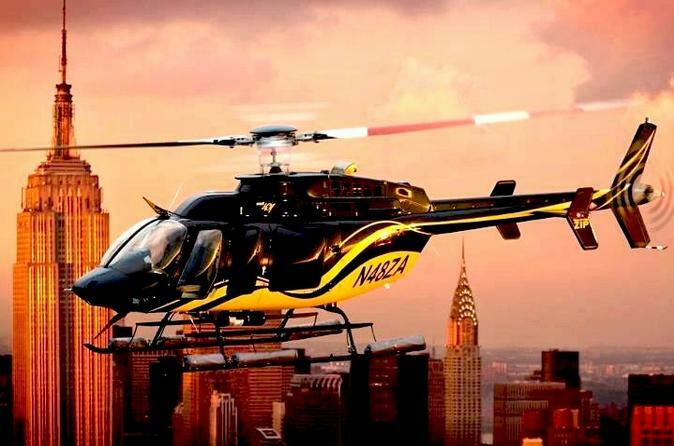 Take to the Manhattan skies for an exciting helicopter tour of New York City! 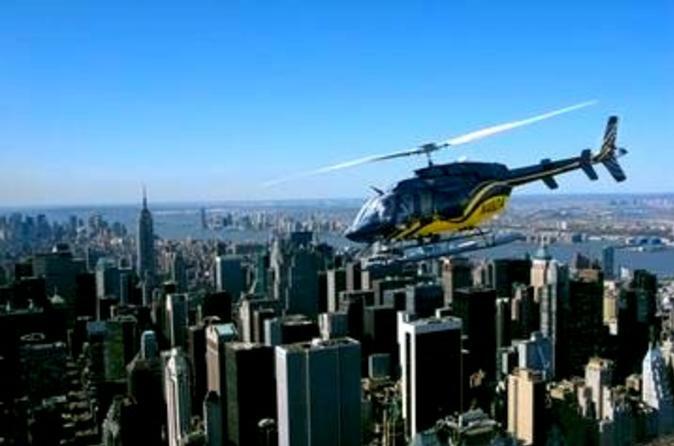 Enjoy spectacular aerial views of Manhattan on this memorable 12-minute helicopter flight that takes you past the Statue of Liberty, New York's financial district of Wall Street and the humbling sight of Ground Zero. Catch a glimpse of the magnificent Empire State Building and historic Ellis Island for a truly birds-eye view of New York City! Discover the beauty and awesome power of Niagara Falls on a day trip from New York. 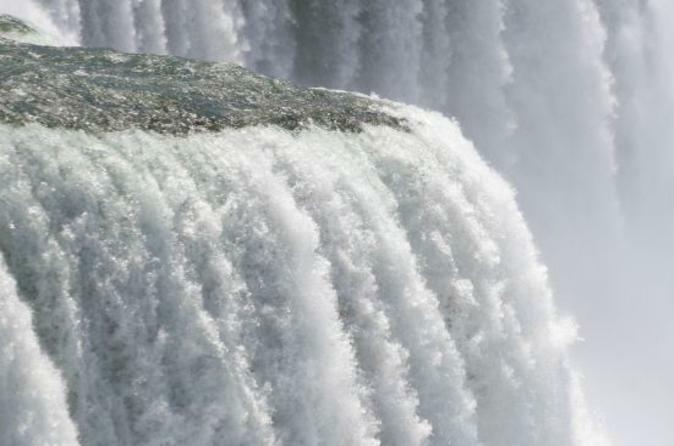 You'll fly to Upstate New York, tour the falls on both the US and Canadian sides (don't forget your passport! 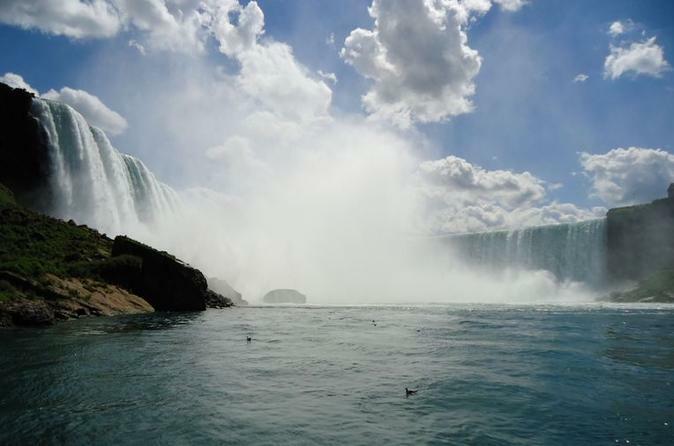 ), see all the sights, including a ride on a Niagara boat cruise or the Journey Behind the Falls. And at the end of an amazing day you'll take an evening flight back to New York. 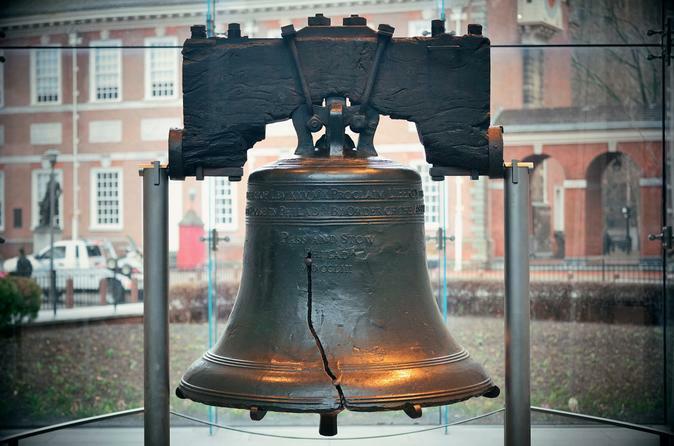 Everything you need to see in New York with freedom and independence! 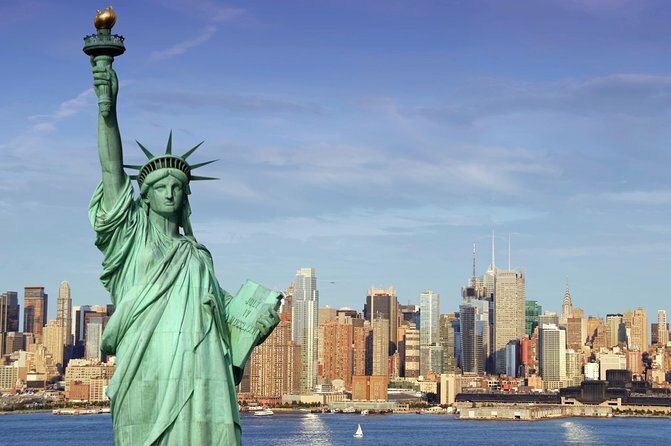 Design your own itinerary of Manhattan, Brooklyn and Harlem on a hop-on hop-off double-decker bus tour, head over to Liberty Island to see the Statue of Liberty with a ferry ticket, cruise around the harbor and see the city from above with your choice of Top of the Rock Observation Deck or the Empire State Building admission. Spend Sunday morning in Harlem, the ethnically diverse borough of New York. 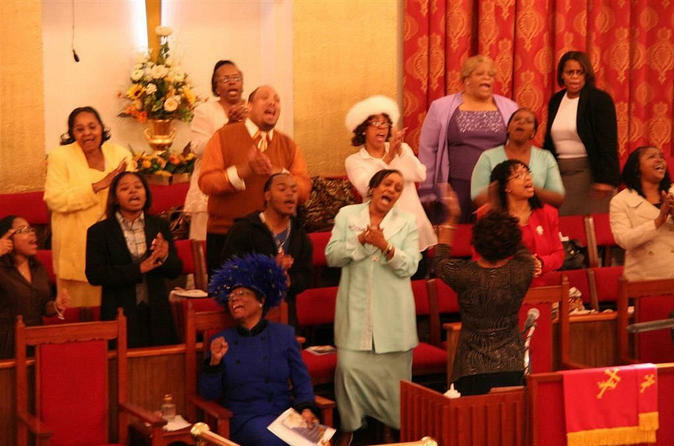 You'll join a local church congregation and experience the soul-stirring power of gospel music on this special visit to one of New York City's most vital neighborhoods. With the New York City Explorer Pass, get access to over 50 top attractions, tours and activities all at one low price! See the Statue of Liberty and Ellis Island, admire sweeping views from the Empire State Building Observatory and much more. Enjoy the flexibility to create your own itinerary and sightsee at your own pace with the help of your complimentary guidebook. 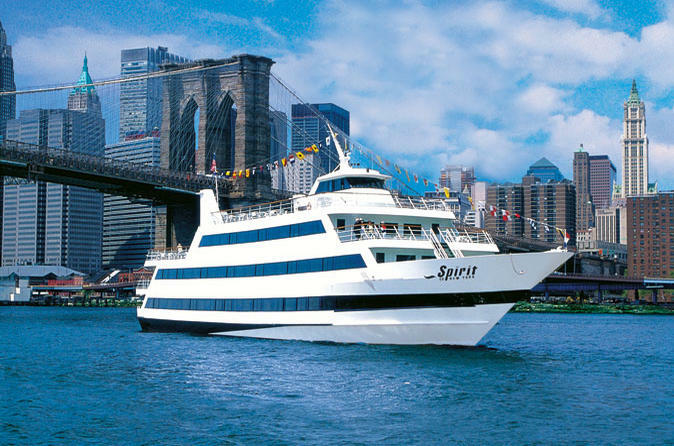 This is the easiest and most affordable way to experience the best of New York City! Save time with direct entry to attractions on your mobile device – simply show your pass using your smartphone! 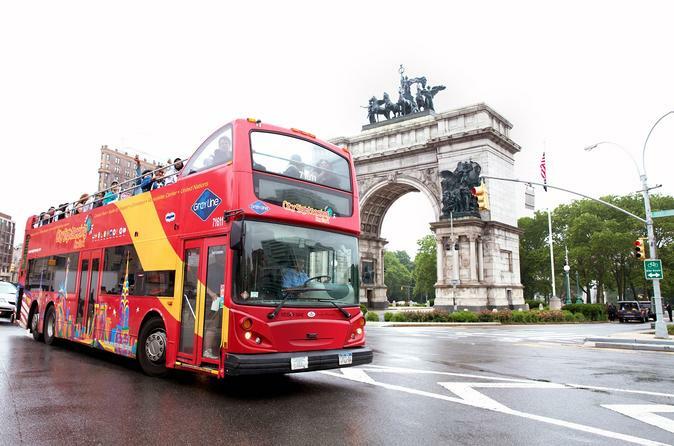 Hop on and hop off at more than 30 stops around New York City with an open-top Big Bus tour, and visit NYC attractions at your own pace. 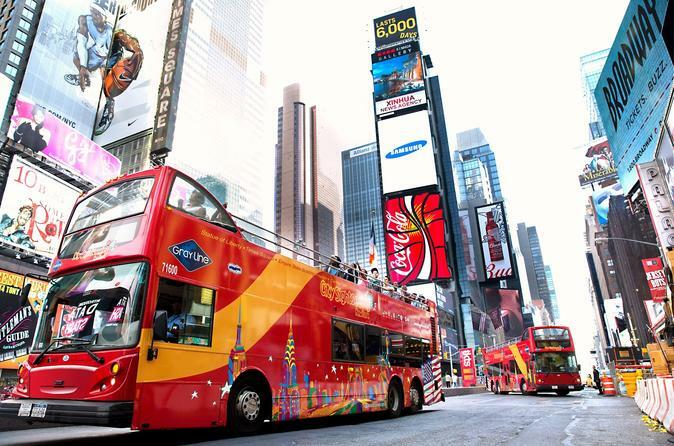 Travel with ease by double-decker bus past world-famous landmarks including the Empire State Building, Times Square, Rockefeller Center and Central Park. With your 24-hour pass, ride two bus loops around Manhattan as you learn about the city's history from your engaging guide. 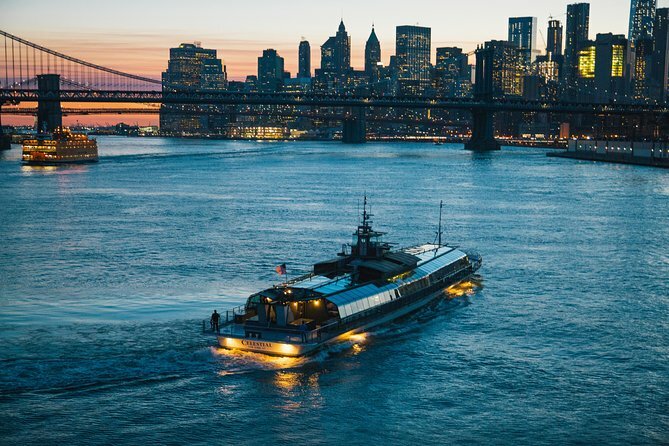 Upgrade to a 48-hour pass and include a night bus tour of the city and a bus loop around Brooklyn, or to the 72-hour pass to include all tours plus a 1-hour sightseeing cruise of Lower Manhattan and admission to the Museum of the City of New York. 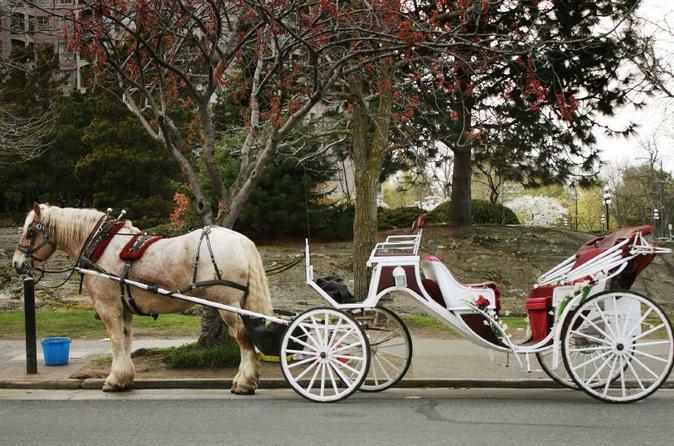 Enjoy a classic experience in New York City and enjoy an open-air carriage ride through stunning Central Park! Board a historic carriage, pulled by a beautiful horse, and enjoy a relaxing evening in the park with your loved one, friends or family. Book your tickets for the Tony-winning extravaganza 'The Lion King' on Broadway. 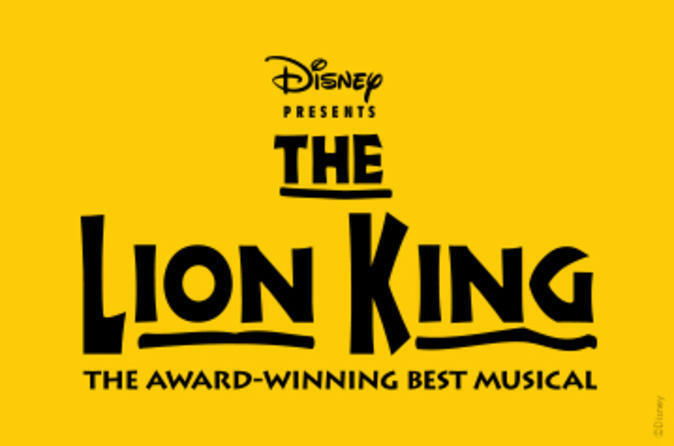 A favorite with children and adults alike, 'The Lion King' is a visual and audio feast of colorful costumes and award-winning music by Elton John and Tim Rice. Don't miss your chance to see this popular Broadway show during your visit to New York City. 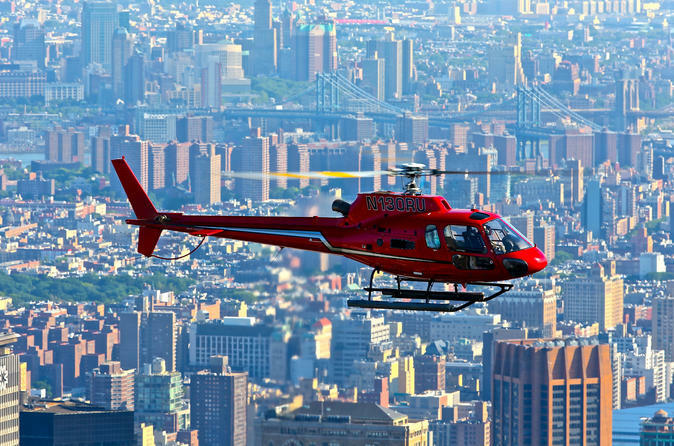 Take to the skies on a helicopter tour to see New York's amazing skyline! 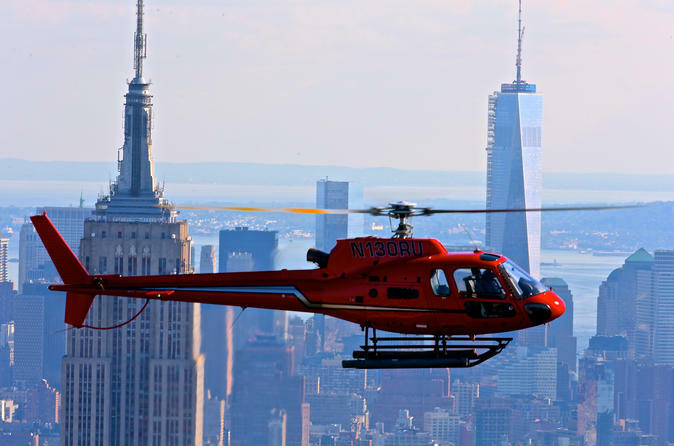 On this scenic 18-minute helicopter flight you'll soar through the sky and experience a bird's eye view of Manhattan's world famous landmarks. This is the best view you can get of New York City! 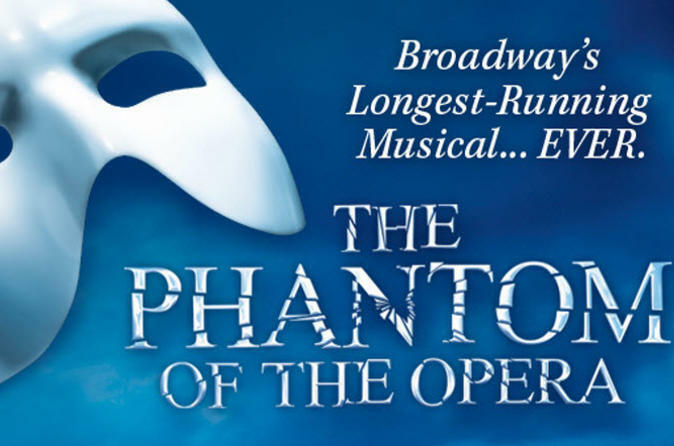 While you are in New York, don't miss your chance to see the longest-running Broadway show in history, Andrew Lloyd Webber's magical The Phantom of Opera. Enjoy seating in the prime Orchestra or Front Mezzanine section of New York's historic Majestic Theatre. The top tickets typically sell out weeks in advance, so book now to guarantee your seat at one of the world's most famous musical theater performances! 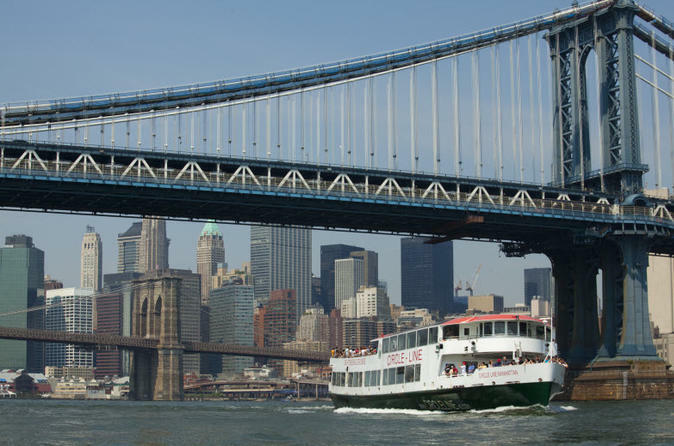 Take the express route to the new National September 11 Memorial and Museum in New York City on a one-day hop-on-hop-off cruise through New York Harbor. Your hop-on hop-off ticket is valid for one day and includes timed admission to the 9/11 Museum, located within the archaeological heart of the World Trade Center site. The museum, containing over 100,000 square feet of exhibition space, tells the story of 9/11 through multimedia displays, archives, narratives and a collection of monumental and authentic artifacts. Intimate stories of loss, compassion and recovery are presented and the lives of every victim of the 2001 and 1993 attacks commemorated. 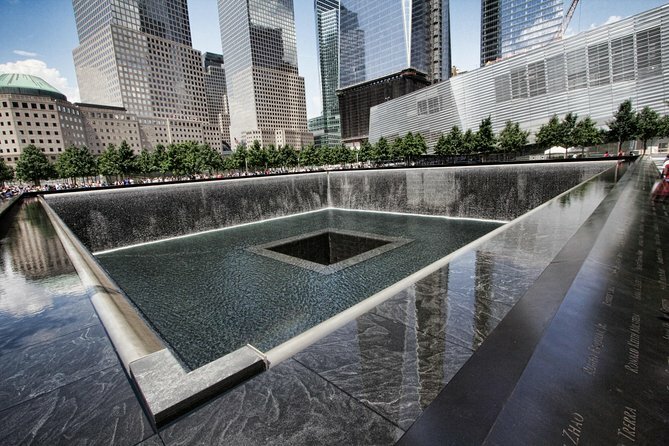 Outside you will find the twin reflecting pools of the 9/11 Memorial, inscribed with the names of the nearly 3,000 victims of the terror attacks. The reflecting pools, nearly an acre in size, feature the largest man-made waterfalls in North America and sit within the footprints where the Twin Towers once stood. The new culinary center of the Big Apple, where food and dining trends are dispersed to the rest of the country, is Brooklyn. And with this half-day tour, you can take a big bite out of it. From old ethnic enclaves to the latest hipster 'hoods, Brooklyn's dining scene is both diverse and cutting edge. Munch pierogies in Polish-dominated Greenpoint and hip farm-to-table fare in Williamsburg. 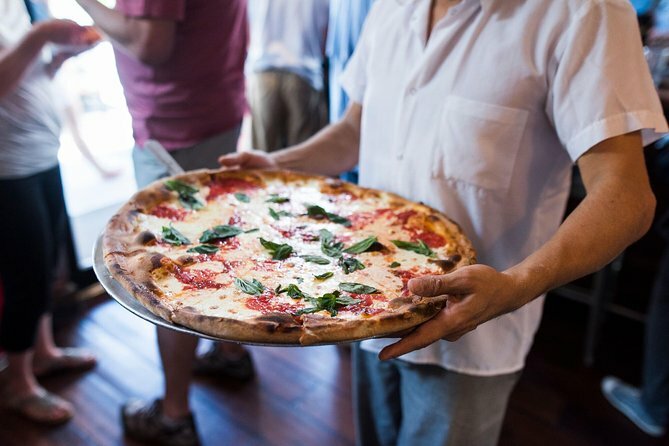 This guided eating tour of New York's coolest and tastiest borough is ideal for foodies and the people who love them. Leave the hustle and bustle of New York City behind and enjoy a relaxing 2-day overnight trip to Niagara Falls. You'll travel to upstate New York by bus and visit both the American and Canadian sides of the falls to discover the majestic beauty of Niagara! 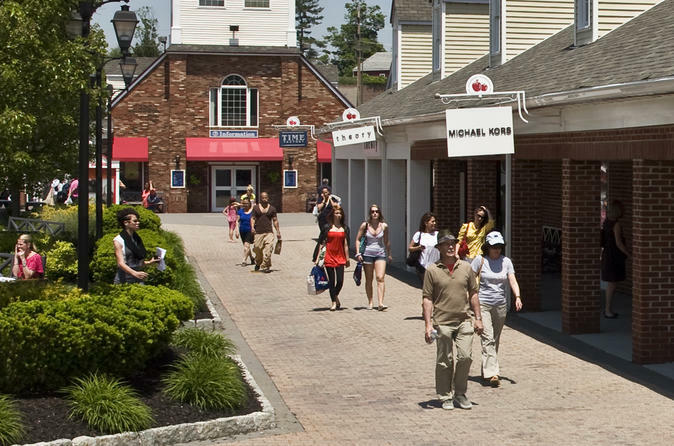 The following day, you'll enjoy premium outlet shopping on the way back to New York. 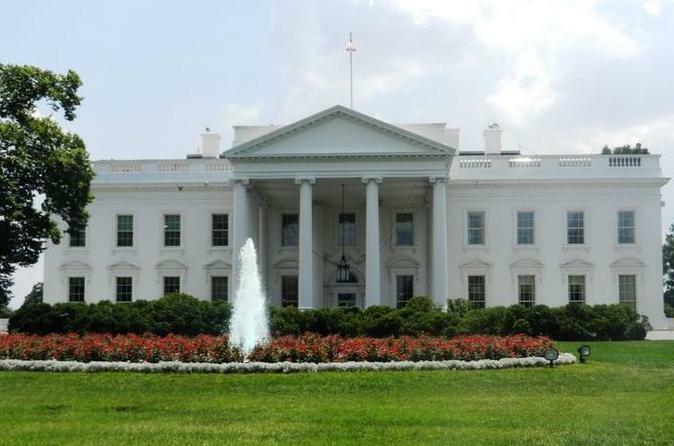 This overnight tour is a must-do when visiting New York City! 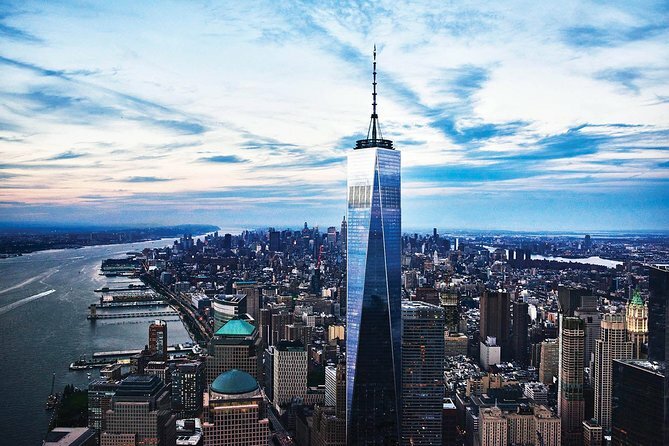 This full experience of September 11th sites in Manhattan includes a 1.5-hour guided walking tour of Ground Zero and the 9/11 Memorial, entry to the 9/11 Museum and One World Observatory. 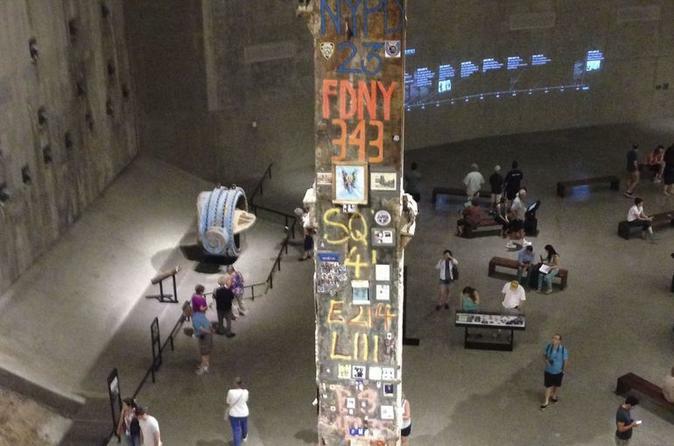 As you're led by a local New Yorker guide with personal connection to the events of 9/11, hear stories of tragedy and heroism and gain a deeper understanding of the attack and aftermath. Select from two departure times when booking. Take a guided tour of New York sites from your favorite movies and television shows, including ‘Friends,’ Birdman,’ ‘Girls’ and ‘Glee.’ On this must-do tour, your entertaining and in-the-know guide — an actor with insider knowledge— takes you to dozens of recognizable locations from TV and film. You’ll catch a glimpse of the Daily Bugle offices featured in ‘Spider-Man’ and spot the legendary Original Soupman who inspired a character featured on ‘Seinfeld,’ among many others. Come ready to sing your favorite show theme songs. Upgrade for priority coach seating! 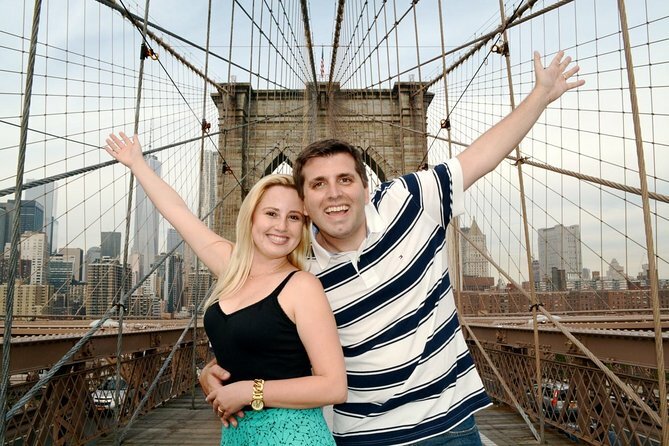 Private Tour capturing all guests in photos with iconic NYC backdrops. All tours can be customized for your desired locations. You are emailed a photo gallery and zip-file within 48 hours. We provide guests with loads of insights and suggestions for the remainder of your holiday such as dining, shopping and off the beaten path locations to visit. We also orient out guests to the NYC subway which will be invaluable to you throughout your stay.